Social media gets a pretty bad rap when it come to generating leads. But I want to posit to you that it’s not social media’s fault. It’s us marketers fault. The main problem is that we try to market on social media in the same way that we market everywhere else. And therein lies the problem. When a person is on social media, they aren’t thinking about an upcoming purchase decision – they just want to look at interesting content and interact with something fun. So that’s what you need to give them. Studies have shown that social media lead conversion rates are 13% higher than the average lead conversion rate. This means that the leads that come from social media are much higher quality, you just need to know how to capture them. Social media is all about sharing cool stuff. And one of the things that people like to share most on Facebook is contests. The best way to entice people to share your contest (after they submit your lead-capture entry form of course) is to incentivize them to. People visit your company’s refer-a-friend promotion page and submit the lead-capture entry form to enter-to-win a prize or get a free coupon offer. After they enter, they are given a unique referral link for the promotion. When one of their friends clicks on this unique referral link and enters the promotion, each entrant is incentivized to share their referral link with their friends in order to win a second (more exciting) prize. Once a person refers enough of their friends, they are entered into the second prize drawing. Set a referral goal that is fairly easy to reach: We recommend requiring entrants to refer 3 – 5 of their friends to be entered into the second enter-to-win drawing. This is a good range, as it will get you exponential results (3 – 5 more entrants for every new entrant), and it’s small enough that entrants will feel as though they are able to reach it (and therefore will push hard to share and refer their friends. Send reminder emails to entrants to refer their friends: The best way to get people to share more, and reach their referral goal, is to remind them via email. We recommend sending emails every 2-3 days throughout the promotion with subject lines that emphasize that the promotion is ‘ending soon’. This reminder will create a ‘fear of missing out’ in the minds of your entrants, and make them more likely to share. Make the second ‘referral goal enter-to-win’ draw prize VERY exciting: People aren’t going to spend time hassling their friends to enter a promotion unless their reward is high. So make sure to offer a prize that people are willing to work for. We recommend offering a prize that is at least $100 in value. This will get people excited, without you having to break the bank to offer it. Refer-a-friend promotions are easy to manage, and can be setup and launched in just a few minutes using a Facebook contest app like Wishpond’s. They want to compete with YouTube as a content platform. Videos are the most engaging type of content. This means that the more videos there are on Facebook, the longer people will stay on the site, and the more ads Facebook can show. This gives marketers a huge opportunity to ride this ‘reach wave’ to get more engagement with their ads, and more leads from Facebook. One company that’s doing this incredibly well is the SEO agency Webris. Webris’ founder Ryan Stewart did a great Moz Whiteboard Friday video on their entire Facebook Video Ads funnel that i highly recommend you check out. This funnel netted Webris a reported $182,324.83 in sales. They don’t look like ads: Nobody wants to look at an ad on Facebook. 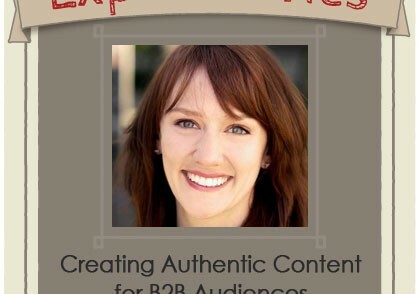 In order to get people to stop and watch your video ad, you need to make it look like a content-focused video. The best way to do this is to scrap the professional-looking cartoon graphics and logos and just make a video of yourself talking about something interesting and useful. They use text on the screen: By default, Facebook auto-plays videos in the Newsfeed, but with no sound. This means that no matter how interesting your talking points are, people won’t be able to hear them, and probably won’t bother to click to hear them. To overcome this, put text on the screen of what you’re saying. This way a person will be able to at least read what you’re saying, and will be much more likely to stop, see something interesting and click to listen. The first five seconds are incredibly engaging: People have little-to-no attention spans when their browsing Facebook. So you need to hook them in the first five seconds of your video with something interesting, or you’ll most likely lose them completely. You can do this by using text and emojis on the screen in the first five seconds of their videos. There’s no traditional ‘hard sell’: Again, people don’t want to be sold to on Facebook, they want to watch interesting content. So instead of trying to sell them directly in the video itself, make your content so interesting and insightful that they will want to go to your website and buy the product you’re talking about. In 2012 when Facebook bought Instagram for $1 Billion, I, along with a lot of other ‘smart people’, thought they were paying way too high of a price. Well, 4 years and 600 million monthly active users later, it now looks like a bargain. For a marketer though, Instagram is tough. Unlike Facebook it doesn’t allow any lead-capture forms or pages within the platform. And you can’t even add clickable links to your Instagram posts. Talk about a walled garden. An Instagram Hashtag Contest is one of the simplest ways to get people to take action from Instagram. In it, people post their own photo on Instagram, then tag the post with a specific contest hashtag that your business has chosen. All photos posted with that hashtag are then displayed in a gallery page on your website or Facebook Page, as well as being shown in one single stream on Instagram. Once in the gallery, all photos with the hashtag can then be voted on, shared or liked. This increases the reach of your contest and your business massively, allowing other users to discover your business on the platform. Relevant contest theme: They’ve chosen a contest theme that is very relevant to their prospective customers, designers, allowing them to showcase their individual designs to a wide audience, while still tying in their brand. They ask entrants to follow them: This is a really small ask, so it won’t deter entry, and it also allows the company to open another channel to market to their entrants on Instagram after the contest is over. A big prize: $1,000 is a VERY enticing prize. The sheer number alone was probably a huge reason why the contest got so many entries, votes and likes. 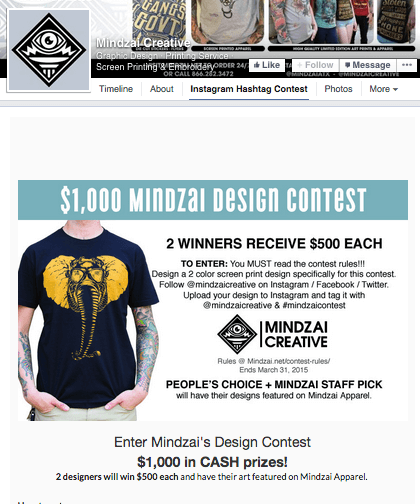 Multiple winner selection methods: I like how they are choosing the winners differently, one by popular vote (which increases the entrant’s feeling of being directly involved and cared about by the brand) and the other by the Mindzai Creative staff. This way, even if one entry has tons of votes, it won’t deter others from entering as they can still win just by having the best design. Use a contest-specific hashtag: Create a hashtag for your promotional campaign. Hashtags are incredibly important on Instagram – it’s an amazingly easy way to connect with any Instagrammer. Using a unique hashtag for your campaign allows you to make a community for your entrants to see the other photo entries directly on their Instagram search.Remember to double-check the usage of your contest hashtag. If it’s a common one, change it to something different and unique to your campaign. For example, use your business name with ‘contest’, or your contest theme (i.e. #wishpondcontest or #summerphotoswishpond). Choose a theme that fits your brand: If you’ve chosen to generate leads from an Instagram photo contest choose a highly engaging topic that aligns with your target customer and brand. Keep in mind the market you want to attract and your goals. With a photo contest, you can gain user-generated content (UGC) to reuse later.For example, if you’re a clothing store, ask contestants to upload their favorite photos of themselves in your products – make it a seasonal theme such as back-to-school. If you are a travel agency, run a photo contest to get dream-worthy photos of people enjoying their vacation. Include a disclaimer about User-Generated Content: If you want to get user-generated content to use later for promotional purposes – be upfront about it, and make sure you get entrants’ permission. If you don’t, you could end up with some negative press and comments, or even a lawsuit, if you use entrant’s content without their permission. I hope this article has helped to change your mind about using social media for lead generation. I know it’s easy to be skeptical about running marketing campaigns that don’t fit into the traditional mold, but on social media, it’s the only way to go. At Wishpond we learned this the hard way when we had to pivot from our original product (Facebook Stores) to Facebook contest apps. Nobody wants to buy directly on Facebook, but they are more than happy to enter a contest and share it with their friends. Nick S teeves is Chief Product Officer at Wishpond. Wishpond’s marketing platform makes it easy to create marketing campaigns that actually get you leads and sales.